Berserk Season 2 contains episodes 13-24 of the anime directed by Shin Itagaki. Peer into the dark once more-the Black Swordsman roars again! Branded for death and hunted by demons forevermore, Guts embarks on a journey to escape his fate and get his revenge on the man he once considered a friend. With his monstrous blade, Dragonslayer, he and a band of unlikely allies will face danger unlike any they've ever experienced before. The answers he seeks lie shrouded in the night. Where's the limited edition for the second set? This is the second time as they did the same to Tales of Zestiria the X. Great series, with some pretty awful CGs only saved only because of the awesome story of Berserk. Now Funimation decides to make it worse by not offering a limited edition set for the second season of both Tales of Zestiria the X and now Berserk. Funimation always talks about how they care about their customers but then they turn around and always does something like this. I am giving this anime a 5 to balance negative reviews. To anyone who dislikes the packaging, extra content or the lack of extra content - GO TO FUNIMATION'S WEB-SITE AND TALK TO THEM. I've enjoyed the hell out of Berserk 2016 series and while the second season was a little bit weaker than season 1, I am still giving it 7/10. CGI is not terrible in any way, it does have some issues in one of the episodes but that will be fixed with this Blu-Ray release. Other than that, I found CGI to be quite refreshing and interesting when pretty much every other anime doesn't even try to explore 3D. Actually, 3D suits Berserk. I'd give it 4/5 in other conditions, but the inadequate reviewers bashing this release (on a retailer's site) are driving me crazy. Berserk is my favorite of all animes, it's amazing. The animation is very good with a little minus its the low frame rate sometimes. The story is amazing. The music is very good too. I'm giving max stars and preordering too. Was skeptical about buying this blu ray due to negative reviews. Purchased it anyway and it was awesome. 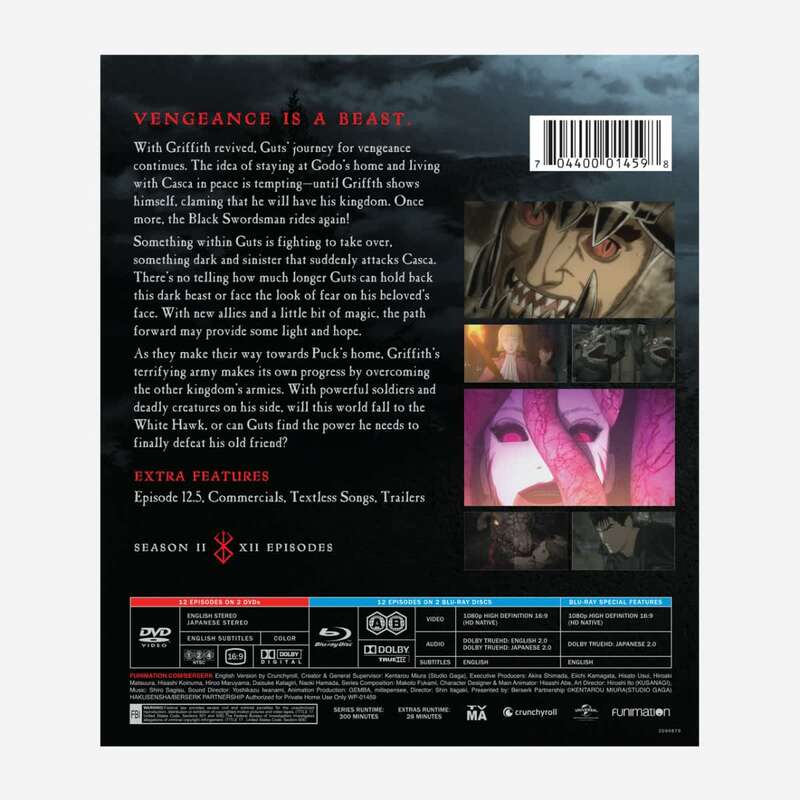 So hyped about adding this blu ray to my berserk collection. Best anime series I own right now. Fantastic fight scenes and incredible action. Animation style and camera angles are a little bit different and I love it. Still delivers the berserk that I have known and loved since 1998. Check it out and judge for yourself. I mean I can be one of those people that complain about the CG but it is Berserk and it follows the source material without censoring it up. This show takes us to much more demonic, graphic, and explicit content. Be warned that much of this was removed for streaming but is shown in this release. Season 2 continues the adaptation of the manga, the controversial animation gets better, the sound design and music and dub continue to be excellent, and the story begins to just scratch the surface of what the manga has to offer. It left me hoping for more. If you are new and interested, I suggest you start with the three recent movies and then season 1 of this production, as this show continues the story from where the movies left off. Berserk season 2....A MUST HAVE FOR ANY "TRUE" FAN! If you keep up with the manga then you will not be disappointed. A lot of complaints for the new series is the animation style being to cg. Well with all the action I'm personally glad they did it this way. You can actually see what guts is doing in the fights instead of seeing blurs. This is Berserk at its finest with the excellent story/plot and action sequences.